Whether your institution is just getting started with sourcing Michigan foods or is working toward set goals, Cultivate Michigan has the resources to help you find, buy and use local foods. Through good food partnerships, we can help Michigan institutions purchase 20% of their food locally by 2020 and support Michigan farmers working to profitably supply this local food to Michigan institutions. Joining Cultivate Michigan is free and open to food service buyers at any Michigan institution, including early childhood programs, K-12 schools, colleges and universities, hospitals and health systems, and long-term care facilities. Track your local food purchases and progress toward the 20% by 2020 goal. Receive materials to help you purchase, use and promote seasonal featured foods. Stay in the loop with our monthly newsletters. Access an extensive network of farm to institution practitioners, coordinators, and supporters across the state. 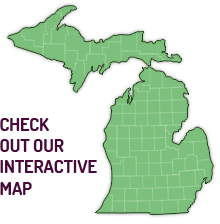 Join one of three Michigan Farm to Institution Network (MFIN) subcommittees, which carry out MFIN’s activities. Be recognized and awarded for your work in local food procurement and data tracking through the Cultivate Michigan Awards. This video offers an overivew of the Cutlivate Michigan campaign and how to sign up. View these videos you would like to learn more about how to sign up and complete your profile or how to complete the basline survey. If you want to be part of these Farm to Institution efforts but you are not a food service buyer at a Michigan institution, join the Michigan Farm to Institution Network! The network encourages local food purchasing by institutions, connects farmers and food producers with food service buyers, and helps eaters to identify and enjoy local foods.